In the fifth century A.D. a man called Qusay, was born in the tribe of Quraysh. He won great honor and fame for his tribe by his wisdom. He rebuilt the Kaaba which was in a state of disrepair, and he ordered the Arabs to build their houses around it. He formulated laws for the supply of food and water to the pilgrims who came to Mecca. Qusay was the great-grandfather of Abdul-Muttalib, and consequently fifth in the ascending line from Mohammed, obtained supreme power at Mecca. Qusay died in A.D. 480, and his son, Abd Manaf, took charge of his duties who was succeeded by his son Hashim who gave his name to the clan which became famous in history as Banu Hashim. Hashim made the Quraysh merchants and merchant princes. Hashim was married to a woman of Yathrib (which later got the name of Medina) and from her he had a son – Abdul Muttalib. In due course, Abdul Muttalib was to succeed his father as the chief of the clan of Hashim. Hashim had a younger brother called Al-Muttalib, the son of Abd Manaf. For a time, he was chief of the clan, and when he died, his nephew – Abdul Muttalib – the son of Hashim, succeeded him as the new chief. Abdul Muttalib exhibited all the qualities which had made the names of his father and grandfather great and famous. As noted before, the city of Mecca, like the rest of Arabia, was without a government and without a ruler, but it was dominated by the tribe of Quraysh. Quraysh was composed of twelve clans, and Banu Hashim was one of them. Reacting to the depravity of the times, the members of Banu Hashim, a half-century before the birth of Muhammad, forged the League of the Virtuous to make some tentative efforts to arrest the moral decline of the Arabs and to improve the social, economic and intellectual state of the country. The major aims of the League were to prevent wars from breaking out and to protect the weak and the defenseless from their enemies. But their greatest gift, not only to the Arabs, but to the whole world, was going to be the child to be called Muhammad, the son of Abdullah ibn Abdul Muttalib and Amina bint Wahab. One of the notable events that took place during the incumbency of Abdul Muttalib as the guardian of Kaaba, was the invasion of Mecca by an Abyssinian army led by the Christian general, Abraha. The attempt to capture Mecca failed as reported in the following verses of the Holy Qur’an. Since the invaders had brought some elephants with them, the year of their campaign ( A.D. 570 ) came to be known as the "Year of the Elephant", which is also year of the birth of Muhammad, the future prophet. The invading army withdrew from Mecca, and the terms of truce were negotiated, on behalf of the city of Mecca, by Abdul Muttalib. One of the distant cousins of Hashim was one Abd Shams. A certain Umayya who claimed to be his son, was jealous of Abdul Muttalib's ascendancy and prestige. He made an attempt to grab his power and authority but failed. He nursed hatred against Abdul Muttalib and his children, and passed it on to his own sons and grandsons who came to be known as the Banu Umayya. The two clans were the antithesis of each other in character and temperament, as the events were soon to reveal when the former led the pack in opposition to Islam. The Banu Hashim were destined to be the vanguards of Islam. Allah Himself chose them for this glorious destiny. 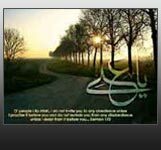 In the case of Muhammad, the Prophet of Islam, the Banu Hashim constituted the powerful group that protected him from the malevolence of the Banu Umayya, provided him security and enabled him to carry out his Divine mission. Abdul Muttalib had ten sons. Four of them became famous in history; Abdullah, the father of Muhammad, Abu Talib, the father of Ali, Hamza, the hero-martyr of the battle of Ohad, Abbas, the forebear of the Abbasi caliphs of Baghdad.